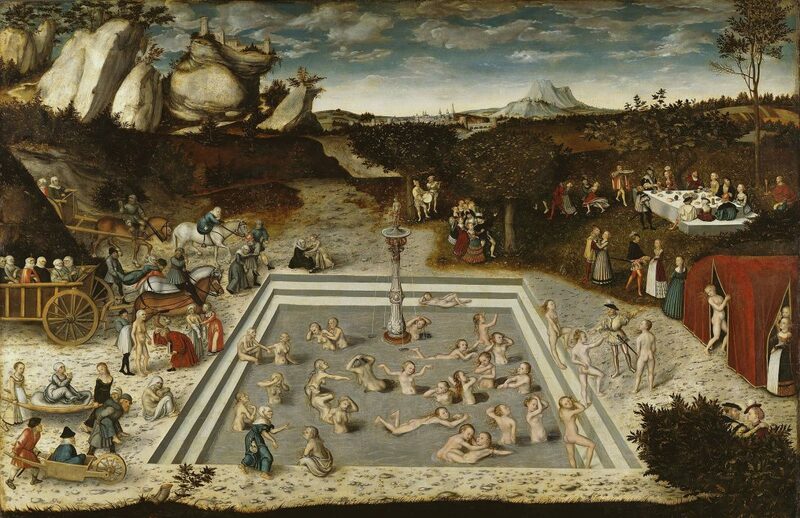 The Fountain of Youth, painted by Lucas Cranach the Elder in 1546. The Fountain of Youth isn’t a literal fountain. It’s an epigenetic pattern, a collection of methylation marks on DNA, and it keeps remarkably steady time, rather like a clockwork mechanism. Although the pattern determines our intrinsic age—as well as our susceptibility to age-associated diseases—we know little about how it might be altered. For example, it has been unclear whether the clock within each cell keeps its own time, or whether a cell’s environment interactions may cause the clock to run fast or slow. To address this question, scientists based at Case Western Reserve University analyzed blood cells, specifically, blood cells that were provided by young donors to old recipients, or by old donors to young recipients. The scientists, led by cell biologist Shigemi Matsuyama, DVM, PhD, hoped to establish whether the clock-setting DNA methylation (DNAm) pattern is cell‐intrinsic, or whether it is modulated by extracellular cues in vivo. “This study is related to the fountain of youth,” Matsuyama said. “We found young blood cells stay young in older people. There was no accelerated aging of young blood cells in an older human body.” Matsuyama’s team found the other direction was also true—blood cells from adult donors transferred to a child stay older. Their inherent steadiness indicates that blood cells could be the master clock of human aging, as they are not easily influenced by their environment, Matsuyama suggested. In this study, Matsuyama and colleagues provide the first experimental evidence that the aging clock of blood cells is cell-intrinsic, and not set by interactions with other cell types in the body. They are now working to identify mechanisms that can change the clock. “In cancer cells, the clock is broken,” Matsuyama pointed out. DNA methylation patterns are unstable in cancerous blood cells and often show odd aging—200 or 5 years old in a 50-year-old patient, for example. “It does not match at all with the actual age.” Matsuyama cautioned that this is why, although it may sound appealing, he doesn’t yet recommend “therapeutic” cell infusions to try to maintain one’s youth.